This New York Central Freight set is the perfect set to build on! Affordable, colorful and fun, you can run just as it is. Or add any of our many separate sales freight cars like the ones shown on the page to expand this set into a long hauler! 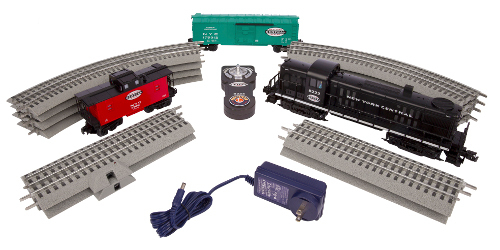 This specially priced set features a powerful RS-3 locomotive that runs with the included easy-to-use LionChief™ remote controller. This special set also includes freight cars emblazoned with the famous New York Central name and logo and built with quality two-axle trucks. Are you looking for a reliable freight service this Christmas season? Look no further, Santa Freight Lines is the best choice in reliable and fast service to get all those toys to the good little girls and boys before Christmas. With guaranteed Christmas Eve delivery, we are Santa’s top choice in helping him in creating the Christmas cheer that lasts throughout the year. Santa Freight Lines- Santa’s Top Rated Freight Line! Champion of the rails, the Pennsylvania Flyer includes a remote control for easy operation and walk-around fun. A powerful 0-8-0 leads the rugged freight smoothly around a full 40"x 60" oval of FasTrack™. There have been many patriotic paint schemes applied to actual locomotive and cars over the years, especially around the U.S. Bicentennial period in the mid-1970s. In fact, official events of the Bicentennial celebration across America were initiated by the railroads with a 21-month tour of the American Freedom Train traveling through 48 states. Remembering the American Revolution and the binding pride we all share in the United States of America, Lionel presents a brand new freight set dressed in patriotic red, white, and blue. Inspired by actual cars on the railroad, this set features the American flag, the Presidential Seal, and the stars and stripes of the U.S.A. on the various cars. A unique Patriot logo is also spotlighted on the rugged U36B diesel locomotive and caboose. Set Includes: 0-8-0 Locomotive and tender Boxcar Searchlight Car Caboose Eight curved O36 FasTrack® track sections, one 10" straight FasTrack® Plug-Expand-Play power lock-on section, one FasTrack® terminal section, and two 10" straight FasTrack® sections. 54W wall pack power supply LionChief® remote for locomotive. Locomotive Features: Electric locomotive controlled by LionChief® remote or Bluetooth LionChief® App Operating headlight On/Off switches for smoke and sound RailSounds RC™ sound system with steam chuffing and background sounds, and user-activated whistle, bell, and announcements Puffing smoke Powerful maintenance-free motor Operating couplers. Rolling Stock Features: Operating couplers Opening doors on boxcar Illuminated light on searchlight car Manually adjustable light position on searchlight car Illuminated caboose. One of the most beautiful trains to grace the railway is back in our Ready-to-Run line-up and better than ever, the Santa Fe Super Chief! 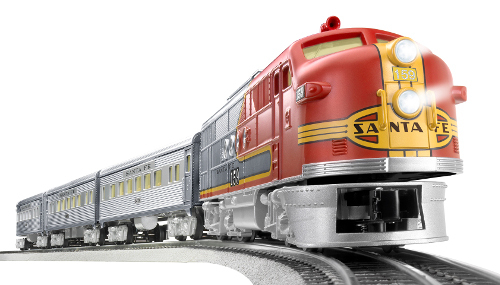 Last produced in 2013 by Lionel, we have taken this iconic set and additional rolling stock to a new level by adding our LionChief® remote and Bluetooth technology giving you multiple ways to operate your set. You are not going to want to miss putting this beauty on your layout!